Eastleigh recorded an overdue win at the Silverlake Stadium to end a run of six games without a victory at home. Tonight’s success also meant it was back to back wins for the Spitfires for the first time since the end of February/beginning of March, to build on Saturday’s 2-1 away success at Welling United. Ian Baird made just two changes to the side that beat the Wings at the weekend with Danny Smith coming in for Warren Goodhind at right back and Sam Butler replacing Shaun McAuley in the starting line up. Neil Sharp started his second consecutive game having bravely battled illness, a year on since being diagnosed with cancer. His evening unfortunately ended prematurely with a hamstring strain/injury midway through the first half. The first chance of the game fell to the visitors on five minutes as Steve Devlin cut inside from the left and saw his dipping shot flash narrowly over Jason Matthews’ goal. Dorchester again came close in the 12th minute on the counter attack; the move finishing with Ryan Moss one on one with the keeper and using a deft touch to chip the ball over Matthews. Fortunately for the Spitfires, Matthews had done enough to narrow the angle and pressure the shot, which landed just an inch wide of the post. Former Eastleigh defender Ashley Vickers, now in charge of the Magpies saw his side continue to dominate early on, looking to press Eastleigh and manage to create a number of chances. Devlin was the next to threaten and force a fine save out of the Eastleigh goalkeeper by unleashing a powerful strike as he connected with Nick Crittenden’s cross from the right. With 23 minutes played, it was still Dorchester making the most progress in terms of shots on target and looking dangerous in the final third. Crittenden hit a volley on the turn which bounced just in front of Matthews; the Eastleigh number one got safely behind the ball to make a good save. The hosts were forced to make their first change of the night when centre back Neil Sharp withdrew from the action with an injury. Young reserve striker Alex Easton was sent on as a substitute with the change seeing Ross Bottomley switch from centre forward to partner Tom Jordan at the heart of the defence. A free kick from all of 40 yards very nearly caught Matthews off guard in the Eastleigh goal as Dorchester’s Ryan Hill went direct for the shot with a sublime attempt from distance. Matthews read the danger well by back-pedalling and tipping the ball over the cross bar to keep his side level. Link up play between Crittenden and Moss saw the ball come across the six-yard box in the 28th minute where Matt Groves (formerly of Eastleigh), slid in but failed to control his low shot. Dorchester failed to take their chances and Eastleigh made sure this would be something they would go on to regret by taking the lead against the run of play with just over half an hour played, and not looking back from there. It was the home side’s first real attempt on goal when Brett Poate lined up a central free kick just outside the penalty area. His left-foot effort took a number of deflections on the way through with SAM BUTLER getting the final touch to divert the ball into the back of the net and break the deadlock in Eastleigh’s favour. Eastleigh seemed to grow in confidence having taken the lead and began to create more as evidenced by Sam Butler’s driving run down the left a minute after the goal, which saw the winger beat his man before supplying a lethal cross from the flank. Tony Taggart met the delivery with a header but Regan Coward had a simple catch to make. Were it not for an excellent sliding and well-timed challenge from Scott Brice on Anthony Riviere, Eastleigh may well have doubled their advantage as the midfielder strode forward in to the danger zone looking to shoot, only to be denied by the defender’s last ditch tackle. A minute into first half stoppage time, Eastleigh were awarded a penalty when Neil Martin brought down Richard Gillespie to the right of the penalty area. GILLESPIE made no mistake from the spot having won the penalty, by picking himself up and confidently finding the bottom right hand corner of goal for his 14th league strike of the season. Straight from the kick off, Ryan Hill hit a speculative effort from the halfway line not too dissimilar to Beckham versus Wimbledon all those years ago, but not for the first time Matthews wasn’t to be beaten as he got back to push the ball on to the post and behind for a corner ensuring Eastleigh held their two-goal advantage at the break. Eastleigh began the second half on the front foot with a couple of blocked shots inside the first five minutes of the restart. In the 54th minute, Richard Gillespie was within inches of adding to his tally with what would have been a stunning goal. Curling a superb left-foot effort from 18-yards out, the former Bashley striker was agonisingly close to picking out the top corner. A minute later, Riviere worked his magic to find space in the penalty area and fire a shot to the keeper’s right. Regan Coward was called into action to make a vital stop to prevent a third goal for Eastleigh. The Spitfires looked far more comfortable on the ball in the second half, working very well as a team and didn’t look even close to surrendering their two-goal lead, if anything was to change to the score line it would have been in Eastleigh’s favour as the hosts took full control of the game. At the back the defence were particularly solid with Ross Bottomley a commanding presence winning everything in the air and forming a strong partnership with the captain Tom Jordan. This foundation allowed for more creativity going forward with the likes of Sam Butler and Richard Gillespie playing particularly well throughout the evening. Tony Taggart had a shot cleared off the line before Eastleigh couldn’t quite turn the ball home from the resulting goalmouth scramble that followed. Meanwhile Nick Crittenden had a rare second half opportunity for the visitors with a low shot that whistled just wide of the upright. Into the final ten minutes, Coward came a long way out of his goal only to make a hash of his clearance straight to the feet of Butler. With the Dorchester goalkeeper out of position, Butler’s shot turned into a cross for Taggart who couldn’t quite keep his header down to take advantage of the situation. Seven minutes from time, Sam Butler drove in a crisp free kick from 30 yards that skimmed off the surface and wide of goal, before substitute Ashley Nicholls had a brilliant curling effort beaten away by the keeper in the 88th minute. The last of the action saw Nicholls miscue a clearance in defence to allow Ryan Moss a clear shot at goal. 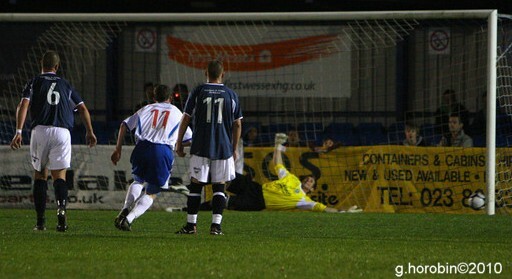 The striker caught the ball beautifully on the volley but Matthews got behind the ball to keep his clean sheet in tact. Eastleigh fully deserved their win for the spirit shown after some early pressure from the visitors. Once the Spitfires got the two goals before the break, they put in a strong second half performance to ensure the home hoodoo was put to bed. Baird’s side take on Bishops Stortford at home on Saturday, which is their final game of the season at the Silverlake Stadium, before finishing the campaign away to Worcester. Eastleigh: J.Matthews, D.Smith, B.Poate, A.Riviere, T.Jordan (c), N.Sharp, P.Adeniyi, S.Butler, R.Bottomley, R.Gillespie, T.Taggart. Subs: I.Oliver, F.Toomer (GK), A.Nicholls (on for Smith), A.Easton (on for Sharp). Dorchester: R.Coward, R.Hill, N.Martin, M.Jermyn (c), N.Walker, S.Brice, N.Crittenden, J.Gleeson, R.Moss, M.Groves, S.Devlin. Subs: K.Hill, J.Coutts, W.Byerley, J.Llewellyn, H.Nodwell.